Relaxed Brits and car clubs. Being on the very edge of Mad Friday. None, other than the risk of minor flooding on some pitches. This is quite a small site with one sub camping club arrangement and then a mixture of pitches from agents and directly from the ACO. It has allocated pitches on mixed terrain, mainly flat grass. The site is lined with trees and feels much more enclosed than its big neighbour. is one of the big sites and tickets are normally fairly easy to get. It has allocated pitches on relatively flat grass. It has a very open, and some would say exposed feel. 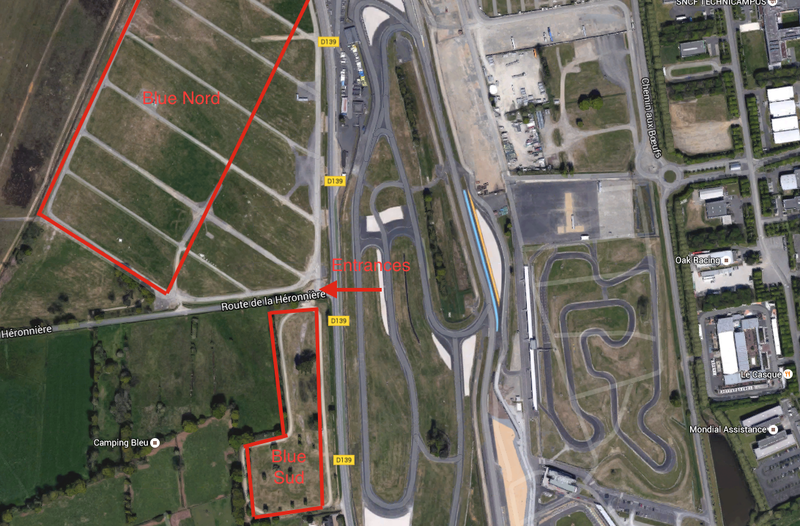 It is situated outside the circuit between the main entrance and Maison Blanche entrance. 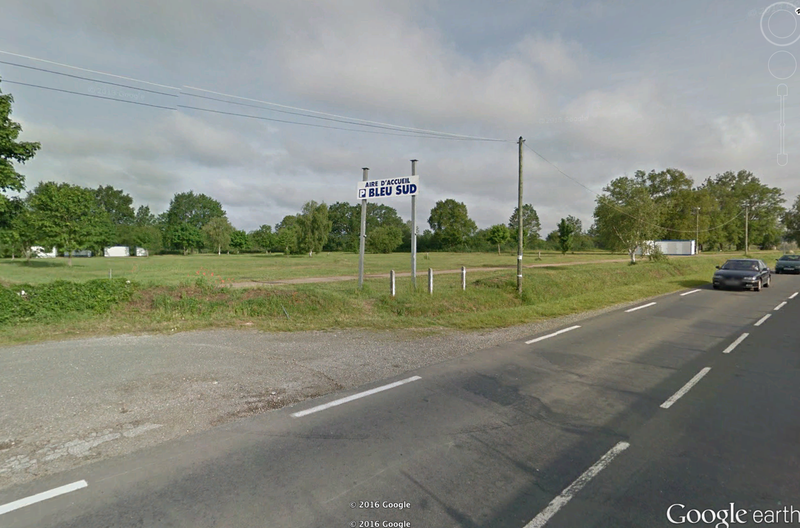 The other side of the site is the Le Mans airport runway. There is a single large temporary shower and toilet block adjacent to Blue Nord. A good atmosphere with plenty of "fun" both on the site and on the road between the site and Maison Blanche. A fairly flat 10-15 minute walk to the track. Arnage village a short drive away with good supermarket and lots or bars. Hard to get multiple pitches together. The walk to Village is probably 20-25 minutes, which some would find long if done regularly. Some pitches are liable to flood in bad weather. Nothing is very close, but there is a great shortcut through to Arnage and the huge Super U by travelling on the small lane sandwiched between Blue Sud and Blue Nord. The road between Blue Sud and Maison Blanche was at one time the place to be seen at on Mad Friday. It is still very busy, but much more closely policed now. You can find a pitch map in our map room. "Well I give a massive thumbs up to the Bleu Sud campsite. Its a lot smaller than its bigger brother Bleu Nord and new for 2014 its now surrounded by permanent fencing by the road to prevent those without GA tickets from just walking in. The atmosphere was relaxed and like MB is mainly a Brit campsite. One minor issue is there was only 1 toilet/shower block however with MB so close I just used those in the mornings. Security was on the entrance 24/7 so that was nice however i left on Sunday so I don't know if they stick around after Sunday evening. It seems this little campsite has upped its game this year."